The DEWALT 20V Max 5.0 Ah Brushless Blower (DCBL720P1) uses an innovative axial fan design that maximizes on air output and run time. The variable speed trigger and speed lock give the user maximum control of the blower's performance up to 400 cu. ft. per minute of air volume providing and 90 MPH of air speed. With an ergonomic and extremely lightweight design, the blower is easy to control and minimizes stress on the arm. Light weight and ergonomic design 7.1 lbs. The BLACK+ DECKER Bare 20V MAX Lithium Ion Sweeper is an efficient cordless sweeping tool for clearing driveways, sidewalks, decks, garages and other hard surfaces of leaves, grass clippings and other lawn debris. This is a bare-tool unit that works with the powerful 20V MAX* Lithium Ion battery to provide longer battery life year after year (battery not included). Not recommended for use in the grass or flower beds. This is a very lightweight unit at just 3.7 pounds; the hard surface sweeper is easy to handle and won't twist the wrist. It also features a built-in scraper which helps loosen wet leaves from surface. Its quiet design allows for early morning sweeping without waking the neighbours. The Black & Decker 40V Lithium-Ion Leaf Blower/Vacuum is ideal for clearing and vacuuming debris quickly from driveways, sidewalks, decks and other hard surfaces. Easily converting from vacuum to sweeper mode, this unit is lightweight, quiet, and offers a comfortable no-slip grip handle. The highest performing PB-2520 is the lightest fully featured handheld blower. The professional grade 25.4 cc engine produces 453 CFM and 170 MPH for quick and easy clean up. A unique S-pipe design reduces the gyro effect on user's wrist improving user comfort. The EGO POWER+ 600 CFM Backpack Blower is the next, big step up in power and convenience. Turbine fan engineering moves air at a staggering 600 CFM, performing better than many gas-powered models. The light-weight, compact, high-efficiency brushless motor delivers longer run time, low vibrations and an extended motor life. Compatible with all EGO POWER+ Arc Lithium 56V batteries to deliver Power Beyond Belief. 90 MPH 400 CFM 20V MAX Li-Ion Cordless Handheld Leaf Blower with 5.0Ah Battery and Charger Included The DEWALT 20V Max 5.0 Ah Brushless Blower (DCBL720P1) uses an innovative axial fan design that maximizes on air output and run time. The variable speed trigger and speed lock give the user maximum control of the blower's performance up to 400 cu. ft. per minute of air volume providing and 90 MPH of air speed. With an ergonomic and extremely lightweight design, the blower is easy to control and minimizes stress on the arm. 90 MPH 400 CFM 20V MAX Li-Ion Cordless Handheld Leaf Blower with 5.0Ah Battery and Charger Included is rated 4.3 out of 5 by 690. Rated 5 out of 5 by metroyep from For me, the DEWALT is the best blower out there.... For me, the DEWALT is the best blower out there. 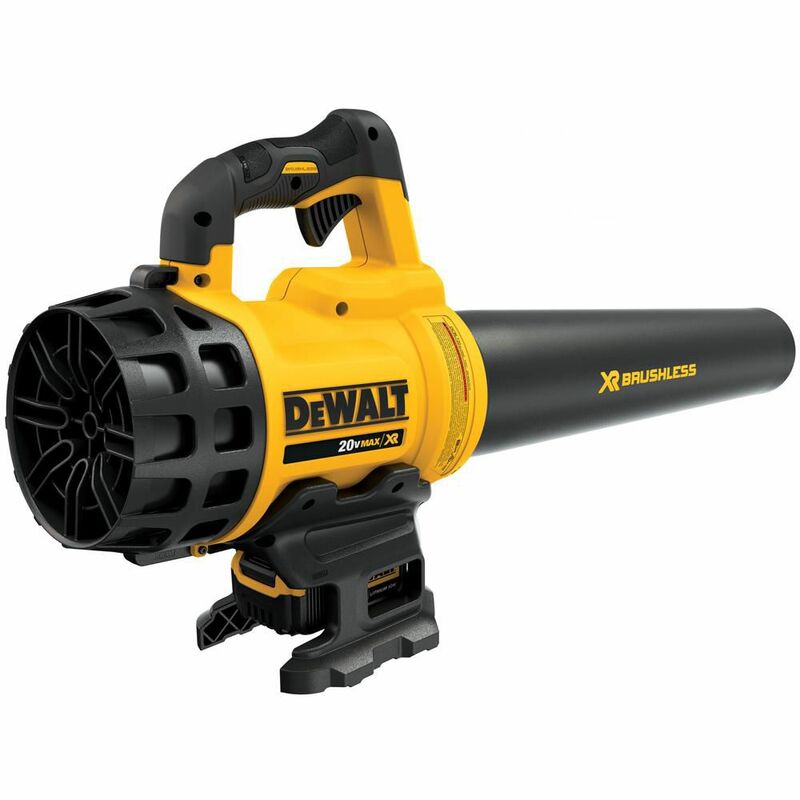 I've used other blowers and they have their strong points, however the DEWALT is better because the battery is positioned directly under the handle. It makes doing side to side sweeping actions easier on your body. Rated 5 out of 5 by BHZ71 from Nice not having to deal with gas or cords. Well... Nice not having to deal with gas or cords. Well balanced and easy to use. Picked up for my elderly parents (80’s) to use as well. Battery holds a good charge. Rated 5 out of 5 by Rusty from Our concern was can the battery hold up?Well the first... Our concern was can the battery hold up?Well the first time it did not last long but we believe the battery did not charge long enough. Since we fully charge battery working better. Rated 4 out of 5 by WorkerWalt from I’m pleased with this blower. Does not have the power... I’m pleased with this blower. Does not have the power of a gas blower but that is to be expected.The reason I did not give it 5 stars is that a friend has the new Milwaukee 18 volt fuel blower and it is more powerful than the Dewalt and is very close to a gas blower but I have all Dewalt tools. Rated 5 out of 5 by Pileman47 from Light and powerful. You can never go wrong with a... Light and powerful. You can never go wrong with a DeWalt product. Rated 5 out of 5 by HomeDepotCustomer from DeWalt products are always high quality and this product is... DeWalt products are always high quality and this product is no exception. Good power for a battery driven blower. Good for home use, but probably not for commercial use. Yes, the FLEXVOLT system will work with the DCBL720P1. Does this unit come with a charger as well? Yes, the battery and charger are included. Is this battery interchangeable with the 20 volt battery on the dewalt 20 volt drill?